Review date: 21 February 2002. 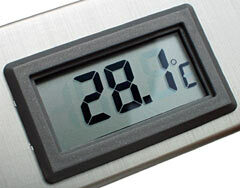 Component temperature is something of an obsession for a lot of PC enthusiasts. The reasoning's simple enough - the cooler your computer runs, the better, and the cooler your CPU and graphics card run, the higher they can be overclocked. This is all true, but only up to a point. CPU speed ceilings do not rise indefinitely with lowering temperature, for a start, and the hotter-means-dead-sooner concept is flawed. United States Department Of Defense Military Handbook 217, a widely used component reliability data source (choke a pig with a PDF version from here, if you feel the urge), started a great enthusiasm among people who ought to know what they're talking about for the notion that every time you increase component temperature by 10°C, you halve its life. There are probably several components in the world to which this applies, for normal operating temperature ranges. Generally, though, it's a big pile of steaming garbage. A lot of gear, particularly desktop PC gear, will have much the same operating lifespan whether it's quite cool (20°C, for instance) or quite hot (60°C, say) when it's running. Which is to say, it'll very probably last longer than anybody will want to use it, either way. Lots of solid state componentry will run just fine for years on end at temperatures that make the outside of the chip packages too hot to touch. It's not good to run a variety of things with moving parts at severely elevated temperatures, but things like commodity ATA hard drives are designed to work OK in poorly ventilated PC cases. You don't have to go nuts cooling them. It's still a good idea to buy a PC case with more than the standard single power supply fan dragging air through it. Another intake fan at the front is thoroughly worthwhile, and a couple more won't do any harm, either. Lian Li make a variety of cases with three 80mm fans as standard equipment, plus whatever's in the power supply; if you want a lot more, you can get them. Keep your cables somewhat sorted so that there's not a clot of wire in the middle of the air path, though, and a two- or three- fan case should be adequate for even quite serious overclocking. My standard procedure for figuring out whether you need to do anything fancier than this with your computer cooling is simple. If it does, then does it crash less when you take the side off the case and point a desk fan at the motherboard? If not, then save your money. If so, then you need more cooling. Temperature monitoring gear that lets you see when things are getting hot enough to crash (you'll have to figure out how hot that is by trial and error...) isn't a dumb idea, either. Especially if the monitoring widget can automatically power up fans to deal with the problem - see my review of the popular Macpower DigitalDoc5 here. DigiDoc5s are popular, largely among people who don't really need them, but they cost $AU132. That's not so bad, if you actually do need something that can monitor five separate thermal sensors and switch fans according to their output. But what if you only need a couple of readings, and don't care about fan control? Well then, for $AU71.50 delivered, there's this. Lian Li's T-4 LCD Thermometer is a simple twin probe temperature display gadget. It doesn't switch anything, it doesn't have backlighting, it doesn't beep, or have a clock, or play Tetris. What it does do is very nicely match the finish of Lian Li's brushed-aluminium cases, like the PC-65 that my current main PC is in. The T-4 is essentially just a plain-anodised aluminium 5.25 inch drive bay cover, like the ones that come with the Lian Li cases that have this finish, but with a couple of holes cut in it and electronic thermometer modules installed. The T-4 will fit in practically any PC case with a spare 5.25 inch bay, though; it's got a couple of threaded mounting holes in the standard locations, and comes with a couple of screws. It's very easy to install. This is the Centigrade version of the T-4; there's a Fahrenheit one too, for people who prefer the boiling and freezing points of water not to be round numbers. 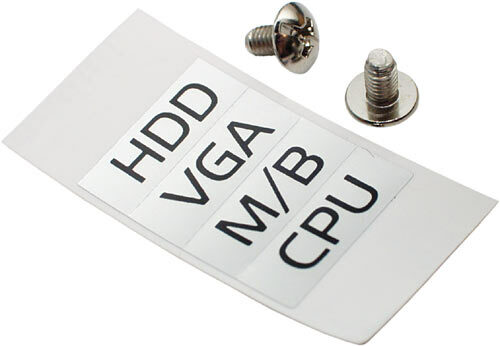 Along with the mounting screws, you get some little stickers to put next to the displays, to remind you which one's talking about which component. Lian Li rate the T-4 thermal sensors for use from -40 to 90°C (-40 to 194°F). The sensors themselves are the super-thin plastic sheet type, which makes it easy to wedge them into small gaps, like the one between a CPU and its heat sink, for instance. Don't put a thermal probe in the actual contact-patch area, though; even a very thin thing sitting in the main thermal transfer path will wedge open the contact patch enough to significantly impact cooling performance. But when the cooler's already installed on the CPU, it's easy to slide a probe this thin up next to the contact area. The probe leads are about a metre long, so it shouldn't be a problem to put them wherever they're needed inside your PC case. Check it out. No power connector. That's because the T-4 runs from batteries, with low enough current drain to make an on/off switch unnecessary. So it'll display temperatures even when your computer's turned off, which you may or may not think is nifty. Out of the box, the T-4 has a couple of bits of tape stuck under the two L1154 (a.k.a. LR44 or A76) button cells that power it. You can see the tape-bits still in place in the above picture. You use a coin to open the battery compartments, you pull out the tape, you reseat the batteries, and the T-4 is active. The other, yellowish bits of tape on the back of the thermometer modules are for mounting the probes. For some reason this tape's provided like this, instead of on the usual backing paper. 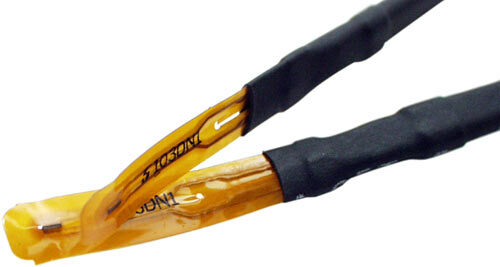 You need special tape for thermal sensors; ordinary adhesive tape will drop off when it gets hot. The two displays on the T-4 are decently legible, with 12mm high digits, and update every three seconds. Which is nice. The question is whether they're actually accurate. A proper standalone dual input digital thermometer, as a separate battery powered multimeter-shaped thingy, will cost you about $AU100. Jaycar have one for that price (catalogue number QM1600); it's what I use for my CPU cooler tests. This thermometer, like all proper thermocouple-based thermometers, lets you tweak its trim; I did that with it when I first got it, using an ice-slurry bath to zero out both readings. It also has Fahrenheit/Centigrade switching, a temp1-minus-temp2 mode, a maximum temperature redisplay button, and a reading-hold button; these are all pretty standard features for this sort of product. It's got a faster temperature update rate than the T-4, too, and more robust thermocouple probes. With the help of some cold water, some hot water and some freezer spray, I compared the T-4's readings with those from the more expensive thermometer. The Lian Li probes did pretty well; around the normal domestic ambient temperature range both of the T-4's readings stayed within 1% of the readings from the bigger thermometer. At elevated temperatures, getting up towards the 90°C ceiling of the T-4's probes, they both still managed to stay within 2% of the other thermometer, and within 1% of each other. At below-freezing temperatures things got a bit weirder. When my thermometer was reading -23°C from a liquid freezer spray bath, the T-4 probes next to it reported -27°C. I'm not sure which of them was more wrong; the boiling point of the difluoroethane freezer spray is -25°C/W. But I doubt this matters to most people. You don't have to pay $AU70-plus for a dual-display digital thermometer. 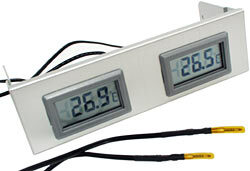 Lots of electronics stores, including Jaycar, sell various models of "in/out thermometer", designed to simultaneously tell you the outdoor temperature and the temperature inside your car or house. Prices start from around $AU20. In/out thermometers may or may not have good accuracy, and they've only got one remote probe - the "in" sensor is inside the case of the thermometer. But the two thermometer modules in the T-4 are completely separate units; there's nothing stopping you from emulating them by buying separate single-input digital thermometers. Jaycar have one of those (catalogue number QM-6322) for $AU13.95, ex delivery. Cheap digital thermometers usually have fat little stick-on sensors that you have to carve down if you want to wedge them between a CPU and a heat sink, but they're fine in stock form for many purposes, and the price is right. Making the little thermometers look like a meant-to-be-there part of your swish modded case is another matter, but for the money, they're still not bad. There's something to be said for dropping a few more bucks on a "proper" digital thermometer, too. It'll be even trickier to make an attractive part of your case, but if you give up on that, you can buy lots of probes and use the thermometer for all sorts of other tasks, even if you permanently install some of the probes in your PC. This isn't a very elegant solution for most people, but it's worth considering. And then, of course, there's the DigitalDoc5. It's about twice the price of the T-4, but it does a great deal more. It doesn't have a nice silvery front panel, though. Decisions, decisions. The Lian Li T-4 isn't a stand-out product, but it's not rubbish either. It looks better than the cheaper options, it works at least as well, and it's easy to install in practically any PC case. For the money, I wouldn't mind if it had a few more features, but as five minute case mods go this is a pretty handy one. I think you'll know if you want it. Aus PC Market don't sell T4s any more, but they do sell the newer and much fancier TR-3, with monitoring of three temperatures and control of three fans, like the old DigitalDoc5 but not as garish. The silver TR-3's only $AU55 delivered; Australian shoppers can order it here. The black version's $AU79.20 delivered, for some reason; Aussies can order it here.